#160238 New Auto Hot Air Plastic Tube Fill & Sealer Model Super-30 with Water Chiller. Unit can do up to 2,400 tubes per hour. Fill Rnage: 5-120ml, Tube Diameter: 10-50mm. Tube Length: up to 200 mm (can do larger fills and tube diameters with the correct change parts). Comes with 1. Set of Change Parts (customer to specify size for their tube). Filler includes a touch screen control system, S/S construction and contact parts, and a high response frequency encoder. 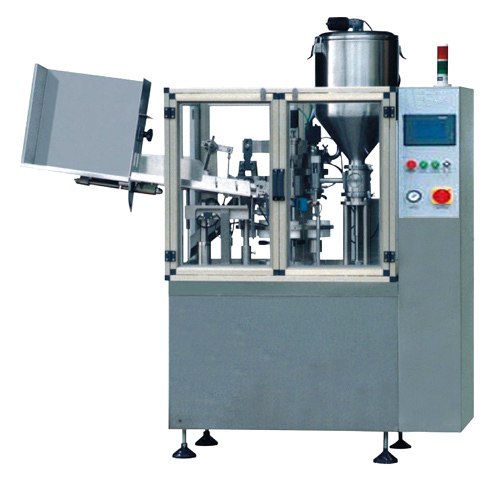 Also includes: an automatic tube loading system with a bulk hopper. Requires 80 PSI of air and 6 cfm to operate. Filling: Piston filler with a no drip nozzle, adjustable fill volume, no tube/no fill sensor. Product Hopper: 40 Litre capacity. Tube Seal System: Hot Air Leister equipped tube heating system, digital readout temperature control, crimp jaw equipped with cooling and a tube trimmer. Unit can emboss a lot number in the seal. Operator safety door system with interlocks. Electrics: 3Ph/60Hz/220Volts variable speed drive. Dimensions of unit: 76” high x 40” deep x 76” wide. Delivery Time: approx 6-8 weeks from receipt of 65% deposit. Note: We require sample product and tubes in order to test/setup the unit.